In cnc lathe machine workshop undoubtedly you will see most of the component assignments with some kind of threading like internal threading, external threading, tapping etc. Of course threading on a cnc machine is not a problem because cnc gives us the flexibility we can use cnc canned cycle like cnc threading cycles or cnc G-code G33, we can even machine taper threads. 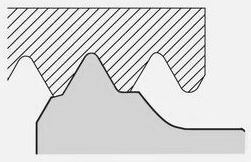 CNC threading inserts are specifically made for thread turning, so therefore threading inserts have shape (profile or form) like the thread profile. You will see two flavors if we divide the threading inserts according to the threading insert shape or profile. 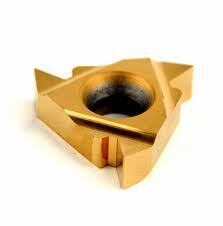 Full profile threading inserts are used for high productivity and long runs. Actually full profile threading inserts are specifically made for a specific type of thread, meaning that a full profile threading insert which is made for one thread type can’t be used for the other threading type or pitch, Why, because the full profile threading insert have the same shape and profile as the thread it is made to be machine. A plus point of the full profile threading insert is that full profile threading inserts have a larger nose-radius, so threads can be made in fewer passes, and this also means that the full profile threading insert will give us a longer run. There are some limitations when you select a full profile threading insert. 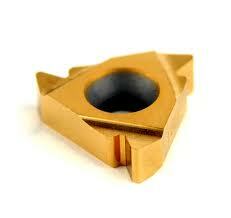 Full profile threading inserts might cut the thread-major-diameter if mishandled. Partial profile threading inserts can be used for various threading pitches and profiles, so now partial profile threading insert can machine different pitches and we not have to stick to a specific profile or pitch which was when we use full profile threading insert. Partial profile threading inserts only machine the thread profile, and these inserts will never touch the thread-major-diameter, so no danger of diameter variation. The nose radius of the insert is sized to suit the smallest profile within the pitch range of the insert.